Danby has been making wine coolers for quite a while and has proven itself to be a big name when it comes to providing people with an extensive variety of solutions for their demands. 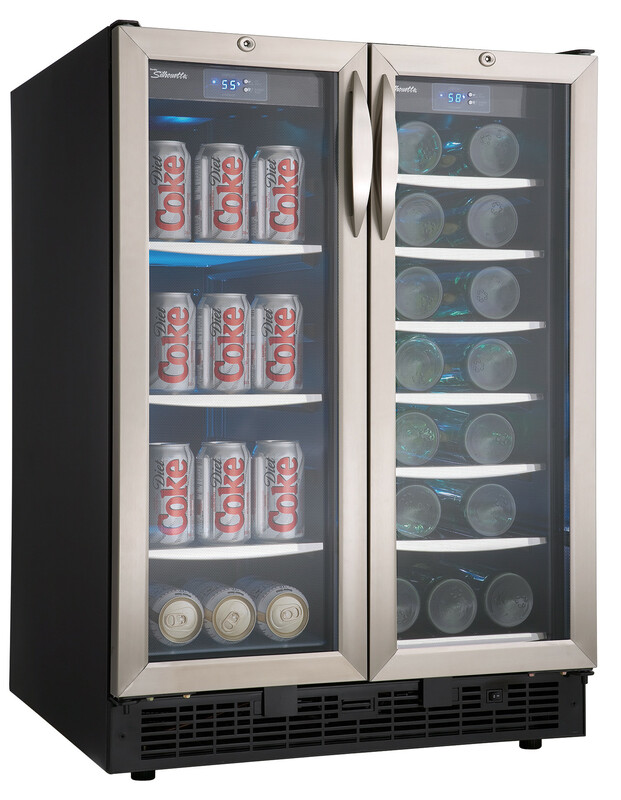 The company makes a number of larger models with one of the company’s most popular options being its 5-cubic DBC2760BLS, is a large cooler that can store an extensive amount of wine among other beverages. This is a large unit that can be placed in an independent area in your home but it could also be placed in a spot that makes it blend in with taller cabinets if desired. If you ever have a need to store a large amount of wine at a given time then this wine cooler could be your best bet. This Danby Silhouette model features an arrangement that includes two halves. These halves come with their own slots for shelves. You can insert and take out the shelves within this device and use them in any way that you might see fit. The shelves, like the door, are made with stainless steel materials. They are also made with perfectly reinforced glass materials that are sturdy and will not break apart easily. There are two French-style doors on the outside part of the cooler. These open outward like a cabinet to give you easy access to what’s inside. The two halves of the cooler are also separate from others. The doors also feature tempered glass surfaces so you can ensure that UV rays will not be at risk of moving into the cooler. This also has a light system that uses blue LED lights to illuminate the inside of the cooler. It does not generate any excess heat. It also creates a beautiful ambient look to showcase the bottles you have. This is a product that should be placed on the floor of any room that you plan on having it in though. This weighs more than a hundred pounds on its own before you even add the wine bottles into it. In addition, it is a little shorter than three feet in height. The most popular feature of the DBC2760BLS model from Danby is that it has 5.0 cubic feet of space for storage. You can store as many as 27 standard bottles of wine within the cooler if desired. The flat surfaces on the shelves also allow you to store cans if desired. You can store as many as 60 12-ounce cans if needed. The fact that you can adjust your shelves to many heights makes it so you can quickly store many types of wine bottles in a spot. You can even store large magnum bottles or even big jugs inside the cooler if needed. The fan-forced cooler inside this Danby Silhouette cooler makes it so you can quickly adjust the temperatures inside the unit. This works more effectively than a traditional automatic defrosting system. There are two separate temperature zones within this cooler. Each individual zone is easy to control and will provide you with different temperatures on each half of the cooler. In addition, the controls are all located on the top parts of the cooler. This is also a frost-free wine cooler. That means there is no need to worry about unplugging the unit and having to waste time defrosting it every once in a while. In fact, this advantage ensures that the cooler will continue to work at an optimal level with fewer materials getting in its way. This in turn should provide you with more support for keeping whatever you have chilled for a long period of time. The bottom vents also ensure that air can move out of the cooler as demanded. This will keep the air within the cooler fresh, thus keeping the wines from suffering with problems relating to premature aging. The Danby Silhouette 5-cubic foot wine cooler should provide you with more than enough help for giving you the assistance that you require when it comes to giving yourself that control you need. If you have a need to keep your wines secured for a while then this will certainly give you the help that you deserve at any time.